We are required by law to provide transport to schools based on distance and age criteria and in order to decide whether a student is eligible for free county council transport, we use catchment areas. 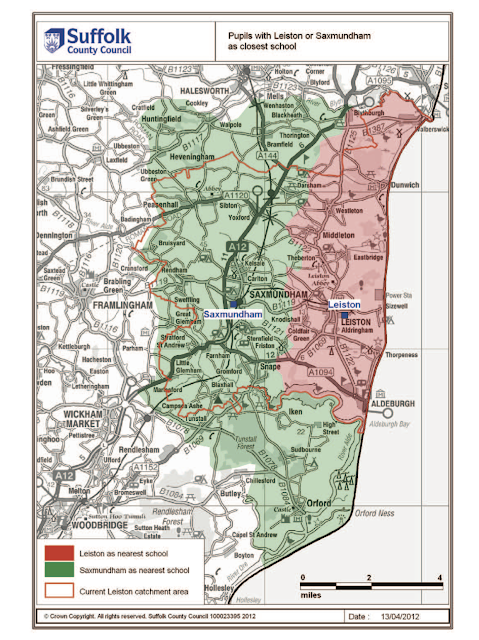 These catchment areas are well-established in Suffolk; in general they work well and are understood by students and families in the area. Under the Government’s free school initiative, any new free schools established in the county would not have a catchment area but the legislation relating to home-to-school transport requires that they are treated the same as all other schools (in particular academies) when it comes to transport. Following the opening of the free school at Clare, and proposals for new free schools at Beccles, Brandon and Saxmundham, we have had to review the arrangements we have in place for home-to-school transport in these areas. 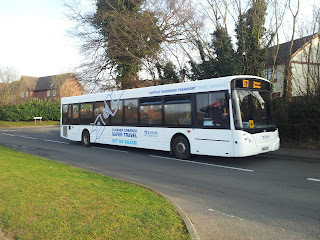 I have already written two blog posts about transport, back at the start of March I wrote Free School, Free Travel about the unfair situation at Stour Valley Community School where families get free travel to the free school where other families would have to pay to exercise the same choice elsewhere. At the end of March I wrote Suffolk Free Schools: No Choice without Transport using material I obtained from a freedom of information request. The DfE seem to have completely underestimated the importance of transport. Without it there is no choice in a rural area but providing it is really expensive.This isn’t London with the tube and free bus travel for children. Indeed last year the County Council removed the discretionary cheap travel scheme for children (the Explore card) claiming it could not afford it. Put simply the current travel privileges for free schools is unsustainable. Schools like Stour Valley Community College (with the support of the DfE) have insisted they have no catchment area and so have undermined the catchment areas that as Cllr Newman says work well and are understood by students and families in the area. So the County Council are forced into having to create a whole new system for the areas with free schools in order to make transport work in those areas and to allow it to maintain the existing system in areas as yes unaffected by free schools. It has published no less than four consultation documents for Stour Valley, Brandon, Beccles and Saxmundham areas. However the worst is yet to come as Thurston pyramid (with the proposed Ixworth Free School) looks to be the biggest nightmare and largest bill. As the map shows clearly the new free school isn’t creating “choice”. In fact if you live in the Saxmundham Priority Area and wanted to send your child to Leiston the opening of the free school will take away that choice unless you can afford to pay for transport and assuming there will actually be any to pay for. This solution is claimed to be “cost-effective” and “fair” but as the analysis shows the disadvantages seem to outweigh this. It looks like it is going to be an interesting debate! This seems incredible, even more expense to be met ultimately from public funds, not to mention the waste of duplicate journeys and their environmental impact. Once again the desires of the few outweigh the needs of the many.